Commonly referred to as fibreglass, glass-reinforced polyester was developed half way through the twentieth century and was used for a wide range of applications due to its high strength and non-corrosive properties. It was initially used in boat building – particularly for small craft such as canoes – but its relatively low weight, waterproof properties and strength led to its use for water tanks, ponds, roof lights and even body panels for cars and commercial vehicles. The ability of GRP flat roofs to be moulded to practically any shape imaginable and be constructed in situ means that it is particularly suited to providing a waterproof surface for flat roofs – new or old. A glass-reinforced polyester roof comprises a single-ply GRP laminate over an appropriate substrate such as Sterling board, finished with a coloured top coat and pre-formed GRP edge covers. The opportunity to have very durable, coloured GRP flat roofs provides design opportunities far beyond a basic felt roof or even a black-only rubber EPDM membrane flat roof. 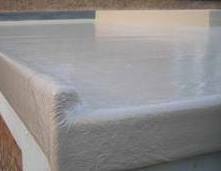 GRP flat roofs have a monolithic glass reinforced polyester laminate which means that is has no joints, seams or welds. And because they are constructed in situ, GRP flat roofs provide a continuous water proof surface which not only looks better than other flat roof alternatives but when installed correctly, should have a much longer life span. Either 18 mm external grade plywood or 18 mm OSB3 Sterling board can be used as a substrate material and the boards should be laid in staggered formation at 90º to the joists, with a 25 mm expansion gap against any vertical walls which abut the flat roof. Most professional installers would fix the boards to the joists using 65 mm galvanised ring shanked nails at 200 mm centres with a nail gun. If GRP flat roofs are installed over a habitable living area, rather than a garage, a warm roof can be fitted which would typically involve two layers of plywood or Sterling board with an insulation board sandwiched in between. Edging trims are manufactured in pre-formed glass reinforced polyester and the various profiles of the trims lend themselves to different uses. Typically there would be a trim to form a neat edge around the roof perimeter, one to create an upstand to prevent surface rain water spilling over and a fillet to fit against a vertical wall which abuts the flat roof. First of all the GRP flat roofs perimeter should be masked off and vehicles moved from the driveway (including the neighbour’s) as a fine spray of laminate material can carry on the wind when a roller is used and it is virtually impossible to remove it from a car’s paintwork. The timber deck should be brushed clean and be dry before any laminate is applied and, depending on the size and shape of the area to be covered, it may make sense to cut the ‘chopped strand mat’ to size before starting. Glass fibre chopped strand mat is available in various weights or thicknesses and for most domestic applications it is acceptable to use 450 g/m² sheets but some installers choose to use the more hard wearing 600 g/m² product. Before the resin is applied to the deck, a GRP bandage is applied inside the pre-formed edges and corners to help form a bond between them and the new roof coating. The resin is mixed with a catalyst according to the manufacturer’s guidelines and applied with a roller to the surface of the timber deck, covering one square metre at a time to maintain workability. The chopped strand mat (the ‘fibre’ in the fibreglass) is laid over the resin and a further coat of resin mixed with catalyst is applied over the top, again with a roller. Subsequent rolls of the chopped strand mat should overlap previous ones by at least 50 mm to achieve good coverage. The area is further rolled with a paddle roller, to remove any air bubbles from within the resin and once this has been carried out the fibre mat and resin coating should be completely transparent as any white or opaque areas suggest insufficient resin. After about 30 minutes the resin should have cured but before a coloured top coat is applied it should be sanded down lightly using ‘40 grit’ sandpaper, to smooth the surface without creating any holes in the GRP flat roofs surface. If a pre-formed GRP fillet has been fitted against a vertical wall above the flat roof a simulated lead flashing should be fitted and sealed with silicone sealant. The surface of GRP flat roofs should be checked for pin holes and these should be sealed with additional resin to avoid water penetration through to the substrate. The coloured top coat is also a resin which requires a catalyst to be mixed with it in order for it to cure and it should be applied on the same day as the main laminate, once it has semi-cured. Do GRP flat roofs have to be installed by a professional? GRP flat roofs should really be installed by competent professionals who are used to the materials used and the processes of installation. One of the reasons for this is that once the installation of a GRP flat roof area has commenced, it really should be finished within the same day – professional installers should be easily capable of completing 20 square metres within a day – a novice installer may quite simply run out of time. It should also be installed in dry weather and if it starts to rain during the installation, the roof should be covered and left until it stops. Can temperature affect the installation of GRP flat roofs? Temperature may also affect the installation and the resins in both the main laminate and the coloured top coat should be warmed if the ambient temperature is below +10º centigrade and should not be used at all below +5º centigrade. Equally, neither the main laminate resin nor the coloured top coat resin should be applied in temperatures above 35º centigrade and out out direct sunlight if possible. How long do GRP flat roofs last? No-one quite knows how long GRP flat roofs should last as they have only been installed since the 1970’s and none of the early roofs are showing significant wear. Modern techniques have also improved, so the best guess now is ‘more than fifty years’. Can I walk on GRP flat roofs? GRP flat roofs are tolerant to foot traffic but if an area is going to be used frequently, the installer can upgrade the standard specification and even create a non-slip surface. Can GRP flat roofs be coloured? Although the standard colour of the top coat resin surface is grey, hundreds of other colours are available, with gloss, matt or even non-slip finishes. Can GRP flat roofs be repaired? Clean the damaged area plus approximately 100 mm around it with solvent sand it down with abrasive sandpaper or even a hand grinder and wipe the area down with an acetone soaked cloth. Apply laminate resin mixed with the catalyst to the area and lay a ‘cut to size’ piece of chopped strand mat over the resin, roll out and cover with resin again. A brush or paddle roller can be used to remove any air bubbles. Once the main laminate has semi-cured the coloured top coat resin, mixed with catalyst, can be brushed over the area and then allowed to cure fully.